I chuckled when I saw this cartoon this morning. That said, I find all of the hysteria surrounding Ebola, ISIS and Elections to be disheartening. This hysteria seems to be a vehicle of "news" and pundit vehicles, as well as social media outlets, to garner higher ratings and publicity. Like the mudslinging political ads of this season, "news" vehicles seem to be tapping into our worst fears and darkest expectations. 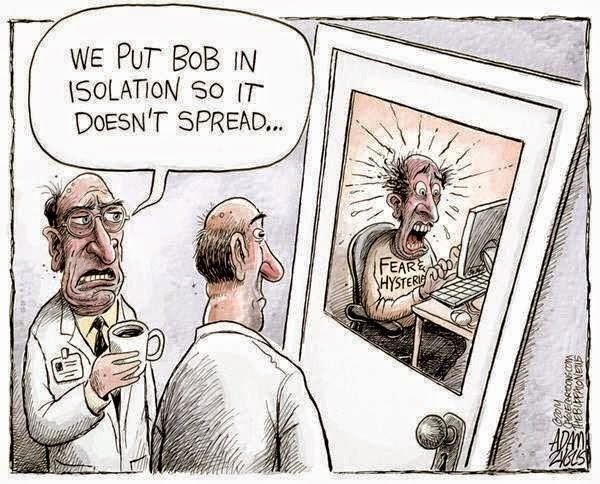 In spite of all this, I still naively hope that we in America will one day wise up to the dark motives of this sort of fear mongering and put Hysterical Bob in isolation. The adverb that jumps out at me is "naively." And yet I, too, harbor this hope.